Canada's Justin Trudeau and Donald Trump met and discussed trade between their 2 countries. Many differences where highlighted in their meeting, from their views on immigration, to global trade and more. On Monday, February 13, 2017, the Canadian Prime Minister, Justin Trudeau had an amiable face to face meeting with the United States president Donald Trump, where they discussed the unique relationship between the two countries and the need to continue trade across their borders. The meeting is viewed as being critical for strengthening relations and maintaining daily, cross-border trade, which is estimated to be around $2 billion. While the two leaders have had a number of telephone conversations since the American president was ushered into power, the prime minister has steered clear on commenting on some of Trump's controversial statements and actions, such as the ban on travelers from seven Muslim-majority countries. 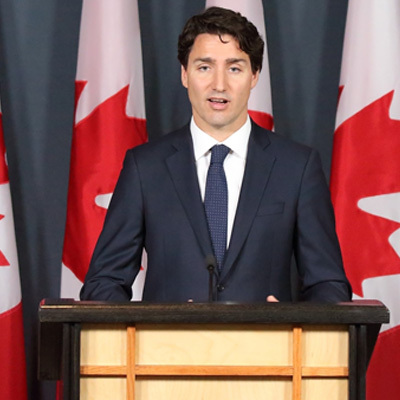 In the previous week, the Canadian prime minister said he would be respectful in touching on areas where the two leaders disagree, and he pointed out that there are issues where he sees eye-to-eye with the American president such as creating jobs for the middle class. President Trump has been in office for a little over two weeks, but that hasn’t stopped the United States’ 45th president from courting controversy. His blunt talk and executive orders, including an immigration ban on seven Muslim-majority countries, have sparked disagreements, heartbreak, anger, and protests. Although the immigration ban has since been halted by the courts, a wide array of people were affected by president Trump’s orders. The president signed executive orders that banned people from seven predominantly Muslim countries from entering the United States for 90 days, these countries include: Iran, Iraq, Syria, Libya, Somalia, Sudan, and Yemen. It also bans refugees for 120 days, and Syrian refugees indefinitely. The ban affected people who are currently in the United States on temporary visas who would normally be allowed to travel to their home country and re-enter the United States, like students for example. According to the Institute of International Education, 17,354 international students from the seven banned countries were enrolled in American education institutions during the 2015-2016 school year. The ban also affects people who have newly arrived in the country on immigrant visas, which are issued based on employment or family status. In 2015, green cards were issued to over 52,000 people from these seven countries. On the day the ban was signed on January 27, Mr. Trudeau posted a photo of himself kneeling beside a child refugee – one of 40,000 Syrian refugees received last year with the caption “Welcome to Canada.” The U.S has taken in 12,500. While Mr. Trudeau has created a gender-balanced cabinet in 2015 and has regularly declared himself a feminist, Mr. Trump has not been so warmly regarded by advocates of gender equality. Along with multiple accusations of sexual assault, which Mr. Trump has strongly denied, the president also admitted that he regretted hiring his first wife, Ivana Trump. When Donald Trump banned refugees from entering the U.S, the Canadian Prime Minister responded with a tweet declaring that those “fleeing persecution, terror, and war” would be welcomed to his country. Although both leaders were diplomatic and highlighted their shared goals and commitment to working together, this first face-to-face meeting only enhanced the feeling that both men are very different. Many Canadians have voiced their pride at having Mr. Trudeau as their leader. Canada and the U.S. are as different as can be on trade right now. One is led by a liberal who champions global trade, the other by a conservative who, in his inauguration speech, pledged an “America first” attitude to not only trade, but immigration, foreign policy, and taxes. Mr. Trump wants to renegotiate the North American free-trade agreement with Canada and Mexico. Any new agreement would have dramatic implications for Canadian businesses and the flow of goods and workers between the countries. When Mr. Trudeau was in Washington, Mr. Trump tried to play down the impact of a new NAFTA on Canada, saying his main focus was Mexico and that he merely wanted “tweaking” to the trade relationship. No timetable has been set for trade talks. The night of Mr. Trump’s election win saw a huge spike in interest in Americans moving north, and Immigration, Refugees, and Citizenship Canada’s website suffered outages due to heavy traffic.